ITR-1 SAHAJ For A.Y.2015-16: For Individuals having Income from Salaries, One house Property, Other sources Interest etc. ITR-2 For A.Y.2015-16: For Individuals and HUFs not having Income from Business or Profession. ITR-2A For A.Y.2015-16: For Individuals and HUFs not having Income from Business or Profession and Capital Gains and who do not hold foreign assets. ITR-3 For A.Y.2015-16: For Individuals/HUFs being partners in firms and not carrying out business or profession under any proprietorship. 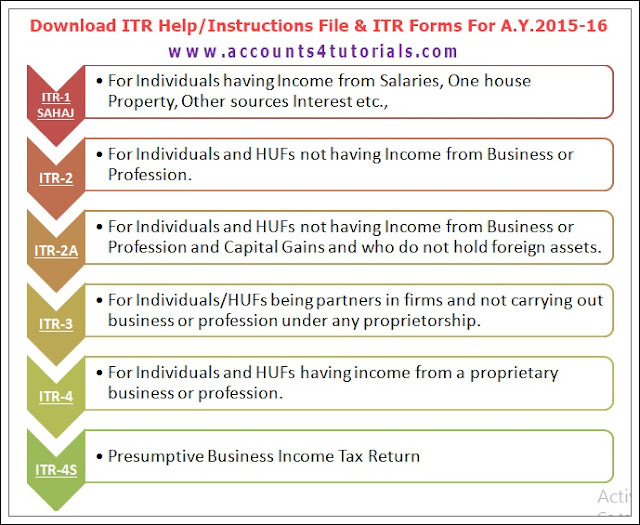 ITR-4 For A.Y.2015-16: For Individuals and HUFs having income from a proprietary business or profession.